Did you guys know that The Philippines has over 6.6 million teenagers? That’s a lot. Haha! Well you know what they say, the youth of today are our future readers! That is why Unilver came up with #TeenWeek! It’s a nationwide week-long program initiated by Unilever Philippines’ top brands—Pond’s, Cream Silk, and Rexona. This program aims to develop 1 million teens to be more confident and future-ready. It seeks to provide teens with the positive reinforcement and faculties that will encourage them to aim high, pushing them to be the best teens they can possibly be. 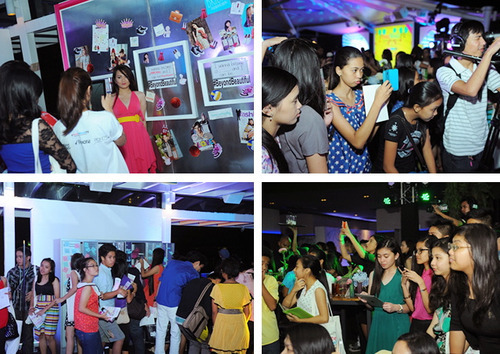 This fun-filled school program kicked off with a #TeenWeekPH bash last September 13, 2013 at the Skye Lounge. Student & faculty representatives from participating schools were given a preview of the activities that will be rolled out during #TeenWeekPH. Meet the #TeenWeekPH ambassadors! #TeenWeekPH will happen in 300 schools nationwide where Teens will get hygiene kits to be well-groomed and primped all the time and learning modules will be conducted for each day of the week, composed of fun learning activities and edutaining (educational + entertaining) videos! The #TeenWeekPH kick-off event was attended by (left to right) Unilever’s Marketing Manager for Oral Care and Deos Neil Trinidad, Marketing Director for Skin Mian Datu David, #TeenWeekPH Project Lead Kay Paras, PR Head for Personal Care Apples Aberin, Cream Silk ambassador Bb. Pilipinas Universe 2013 Ariella Arida, Pond’s Beauty Council ambassador Laureen Uy, celebrity and fashion blogger Dani Barretto, Rexona teen ambassador Elmo Magalona, Pond’s endorser Julia Barretto, Unilever Philippines Vice President for Personal Care Gina Lorenzana, Marketing Director for Hair Dorothy Dee, and Pond’s Sr. Brand Manager Cesca Silvestre. Student & faculty representatives from participating schools enjoyed the preview of the activities that will be rolled out during #TeenWeekPH’s activation from September 23-27. Through #TeenWeek, top Unilever brands will directly interface with teens through modules that help develop their self-esteem and address key aspects of teen life: good grooming, friendships and relationships, dreams and ambitions, and talent and confidence. There will also be online contests throughout the week in the official website www.TeenWeekPH.com. I can’t wait for next week!